I am designing a platform where a large number of cloud-enabled embedded devices will be sending push notifications to mobile apps using Amazon SNS. Each embedded device should create a SNS topic and publish to that topic. Users will register to a topic and receive these notifications. Create a single IAM user that will be 'shared' by all embedded devices. Not a good idea: if a single device is hacked, all of them are compromised. 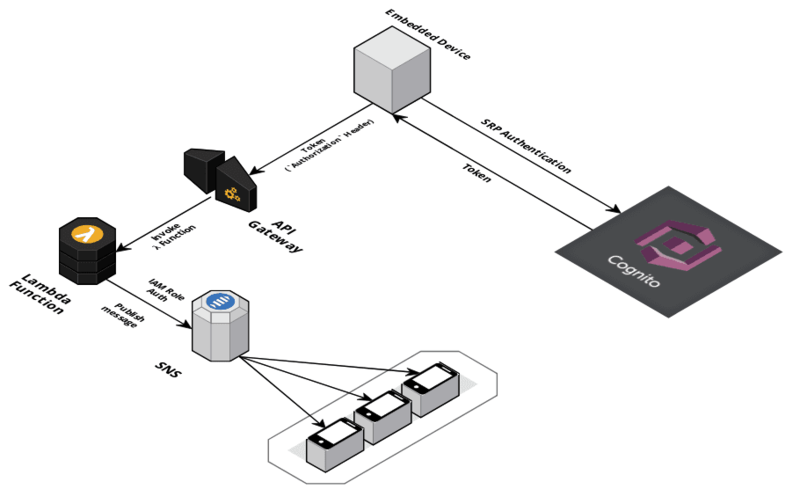 Setup an intermediate server which talks to AWS; an IAM user would be created for the server. The server then generates temporary credentials on demand for the embedded devices, and the devices use this to authenticate with AWS. I don't like this because it introduces an additional dependency / single point of failure (the intermediate server). What other options do I have? I am sure I'm not the first one to face this problem. Not the answer you're looking for? Browse other questions tagged amazon-web-services authentication amazon-iam amazon-sns or ask your own question. How to subscribe a specific instance within an elastic beanstalk application to an SNS topic? AWS IoT MQTT on ESP8266 — Put Secret Key on Device?